In order to help prevent the spread of illness, we recommend that your child stay home from school if experiencing cold or flu symptoms. Very stuffy nose and/or cough. Mild sore throat with no fever or no known exposure to strep throat. Fever greater than 100° by mouth. Student must be fever free without medication for 24 hours before returning to school. Continuous coughing that is not relieved with cough medicine. Diagnosed with strep throat. Student may return to school 24 hours after starting antibiotics. General fatigue, discomfort, chills, weakness or muscle aches. Frequent handwashing is the BEST way to prevent the spread of germs. Wash your hands often with soap and water or hand sanitizer. 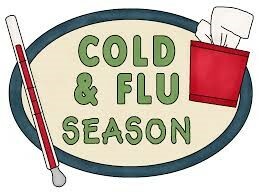 Cover coughs and sneezes with a tissue or use an elbow or arm if no tissue is available. Do not share drinks or food. Get plenty of rest, eat healthy and drink lots of water. Avoid people who are sick and stay home when you are sick.